Did you know, there are questions you should ask your boyfriend to not only deepen your relationship but to add some fun. According to Leslie Becker-Phelps, Ph.D. at WebMD, sharing personal thoughts and feelings is crucial to building a lasting relationship. Whether your relationship is brand-new, or you have been together for a while, try out some fun questions to ask your boyfriend and spark meaningful conversations. Learning all you can about your boyfriend's background will give you a better sense of who he is. This is especially important if you think the relationship might have long-term potential, so here are the kind of questions you should ask a potential boyfriend or a new boyfriend. Where are you originally from? Where else have you lived? What was your favorite place and why? Do you feel your parents treated you and your siblings the same or was there favoritism? Do any health problems run in your family? What's the kindest thing someone's done for you? Are you close with members of your extended family? What are some prominent things that have happened in your past that you think have contributed greatly to who you are today? What are some things in your childhood you'd like to improve upon for your child/children? Tell me about your favorite childhood pet. Did you have a lot of friends as a child, or did you have just a few really good ones? How did you spend your summer vacations? When your relationship is still fresh, it's nice to get to know the silly basics of what makes your man tick. What's his favorite color? Which food does he absolutely despise? Can he beat you in a game of Monopoly? 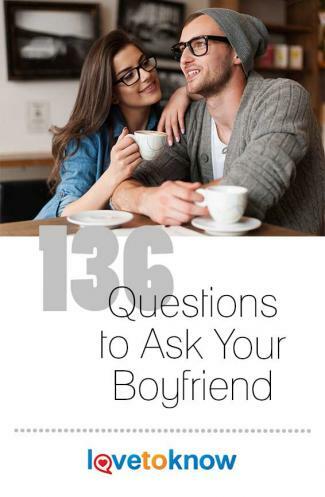 Here are some fun, cute questions to ask your boyfriend. Would you go dress shopping or shoe shopping with me? Another girl hits on you in front of me. How would you handle it? What about if I wasn't there? What's the weirdest thing you've ever eaten and liked? Can you tell me about your most embarrassing moment? If you had a horse, what funny name would you give it? If you're having a bad day, how can I cheer you up? When you're sick, do you like to have someone taking care of you, or do you prefer to be left alone until you're better? If you're lost, do you ask for directions? What would you do if I were suddenly unable to speak your language? What's one household chore you don't know how to do? What's one type of household chore you're unwilling, or at least very resistant, to do? If we were in a group at a party and told a horrible joke that no one else laughed at, what would you do? How much time do you spend on social networking in a week? Will you tell me if I have lipstick on my teeth or if my hair is standing straight up? 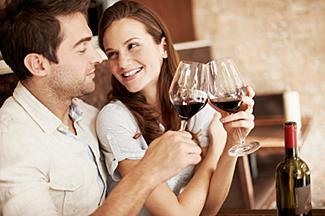 Fun questions help get the conversation going, but you'll want to delve into more intimate matters eventually. These deep relationship questions will give you a better idea about your boyfriend's relationship history and a hint about how your own relationship might turn out. Are you and your ex still friends? Have you put yourself at risk for an STD by skipping protection? Have you been tested for STDs/HIV? Would you be willing to go in for testing again before we get more involved? How would you handle it if you thought another guy was hitting on me? How would you handle it if you lost your job? Are you able to keep your anger under control? Do you like to travel or would you rather stay home? Do you think it's OK for men and women who are in separate relationships to go have coffee or lunch together? What are some of your ideas for how to keep a relationship strong over time? Do you think it's OK for people to vent to others about their significant others, or do you think that it's completely disrespectful and complaints should be kept within the relationship? When you break up with someone, how do you do it? What's the worst breakup you've ever experienced? Why was it so bad? What are your thoughts on divorce? What do you consider cheating, besides the obvious? Where do you see us in five years? If a girl asked for your number, would you give it to her, just in case we break up? If one of your friends or family members told you to break up with me because he/she didn't like me, would you? How do you feel about my family and/or friends? How much time do you think we should each spend with our family/friends outside of gatherings that require us both to be there? What do you tell your friends about me when I'm not around? If one of your friends flirted with me and I told you about it, how would you handle it? Moving in together is a major move forward in any relationship, so don't go into it blindly. Your boyfriend's answers to these revealing questions should help you determine if the two of you have enough basic compatibility to live together on a daily basis. Do you want to live together? When do you think you will be ready to move in together? How long do you think we will live together before getting married? How will we make sure the chores around the house are divided fairly? Are you a neat freak, or do you tend to leave socks and other items lying around everywhere? Do you plan to adopt or purchase a pet in the near future? Would you ever consider having additional roommates to cut costs if we had a place with enough space? If I have to work really late, will you have a problem with cooking or picking up some dinner for both of us? If you reach the stage where the two of you are talking about marriage, it's time to discuss major life issues before you get engaged - not after. Asking your partner these future questions could save you from the heartache of a broken engagement or, worse, a future divorce. Where do you want to live in the long term? City? Mountains? Country? What is your philosophy on money within a marriage? Is what's yours mine and vice versa, or will you prefer separate accounts and a roommate situation with bill paying? How do you feel about taking in family members during a hard time? Elderly parents? What's your take on getting the housework done if both partners work outside the home? What are your thoughts on how to discipline children? How important do you think date nights are when you're married and have children? Are you open to the idea of marriage counseling? How much time do you expect us each to be able to hang out with our friends once we've had children? Would you be agreeable to staying home with the kids if my career was about to take off or if I made enough at my job to support that arrangement? Who will be responsible for screening baby sitters or a nanny? If our spending/saving goals differ, how will we compromise? Do you want a small wedding, a large one, a visit to the courthouse, an elopement, or do you have no opinion at all? What's your opinion on credit cards? What are your plans for getting out of debt or staying out of it? What would you say if I told you I have a large amount of debt? How would you handle it if we found out our child had a terrible illness or disease? Do you think that prenatal tests for certain birth defects or disorders should be done? How would you react to bad news? What do you think each person's role is in a marriage? Would you be willing to take on two jobs temporarily if that's what it took to make ends meet? 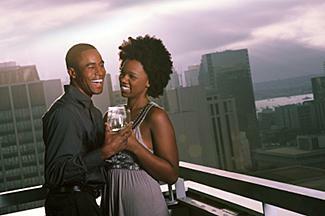 Are you satisfied emotionally and sexually in the relationship? What is your stance on divorce? If I got really sick with a long-term illness, would you stick around and take care of me? If I have a disagreement with one of your family members or friends, will you stand up for me? Try not to jump to any immediate conclusions during your question-and-answer episodes. Instead, take a day or two to mull over his answers and decide where you want the relationship to go. Think about what's important to you in terms of your current relationship. While you won't want to have his answers chosen for him ahead of time, you will want to think about what kind of answer you'd like him to give. Think about which points are non-negotiable, and which issues you are willing to compromise on. 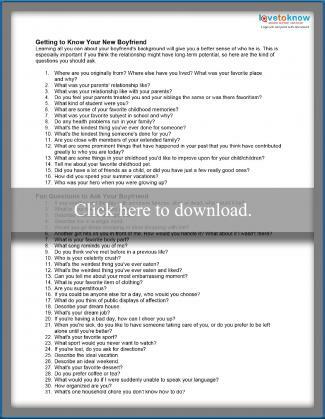 If you find his answers are not compatible with yours more often than not, you may want to cut your losses early. Of course there are always ways to compromise when someone is very special to you.